Feeding four kids has been a journey for our family. Before having kids, I had high expectations: everything would be cooked from scratch, my kids would love vegetables from the beginning and we would always have sit-down family meals. Four kids, picky eaters and juggling six family member’s busy schedules later, has thrown more than a few wrenches into my idealistic picture of family meals. But over time I have figured out meals and schedules that work for our family, and our schedule. 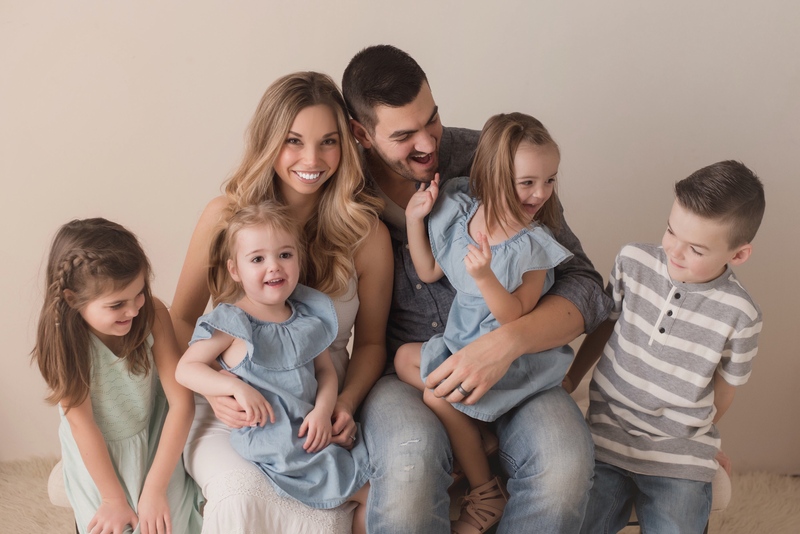 For the first couple years following our twins being born, (which were our third and fourth kids), I was always scrambling. Mike had a long commute to work at the time and was often home after our kids were in bed. Our kids meals were usually a variety of healthy snacks thrown together with the TV blaring in the background. But as the dust settled, and Mike started making it home for dinner, family meals started to emerge. 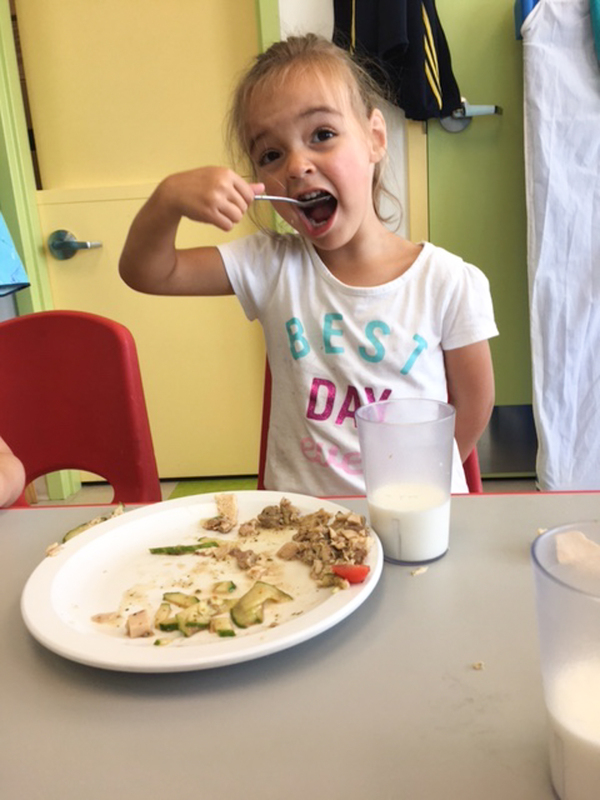 Our big kids have shocked us recently, by not only trying new vegetables, but enjoying healthier options as well. 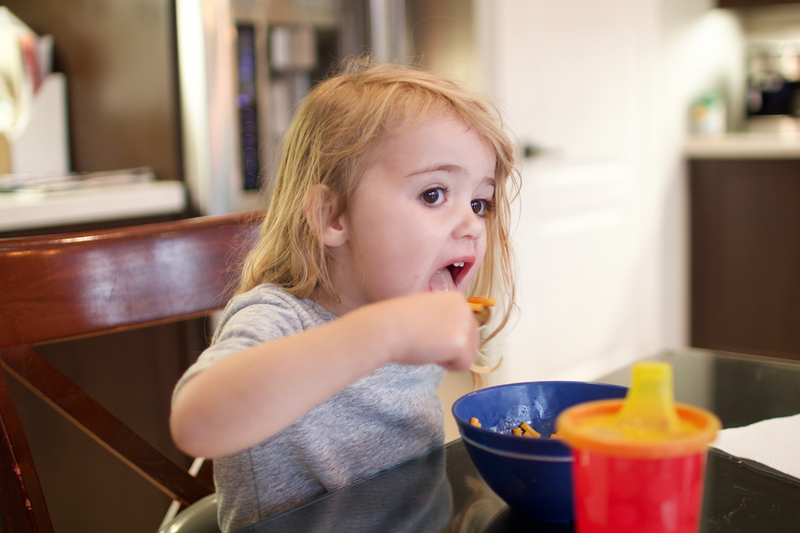 Our twins, who are now three years old, are entering the picky eating phase, and I know that it is just a phase, so instead of obsessing about each meal and snack each day, I look at the day as a whole, and relax… a lot. Here is an example of what our twins eat in a day. This is a weekday, when our twins are at daycare all day. At Kids and Company, Mia and Everly are served a home-cooked lunch planned by a nutritionist, and two healthy snacks a day. This is what I consider my nutrition safety net. Out of our twins, Everly is the more adventurous eater. She loves fruit, and well, most foods for that matter. Today Everly is having a muffin, apple slices and skim milk for breakfast. Mia, on the other hand, is a pickier eater and consumes a lot less food than Everly. 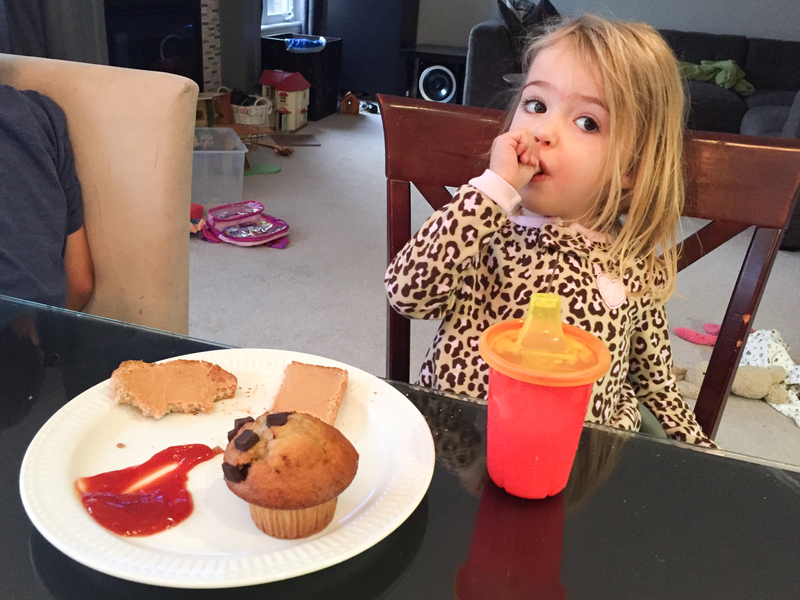 Today Mia is having peanut butter on whole-wheat toast, dipped in ketchup, (yuck, I know but she loves it), and a muffin with skim milk. 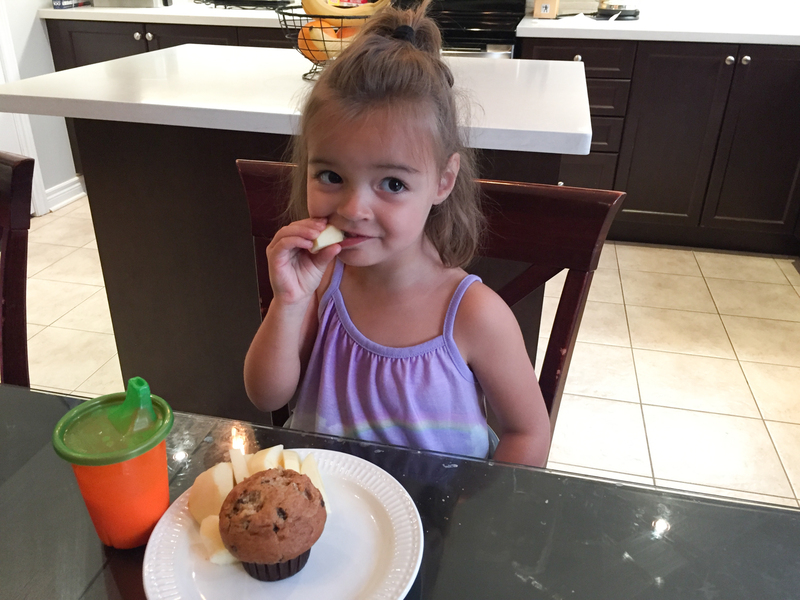 For morning snack at daycare, Mia and Everly had a whole wheat english muffin with Wow butter and cantaloupe cubes. 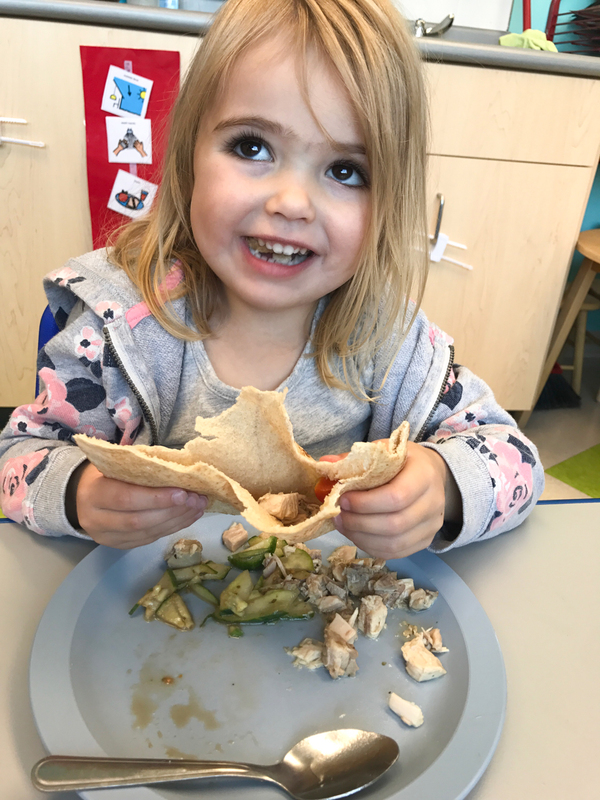 Today they are eating chicken souvlaki with a whole-wheat pita, cucumber and tomato. For an afternoon snack at daycare, Mia and Everly had peach cobbler and grapes. 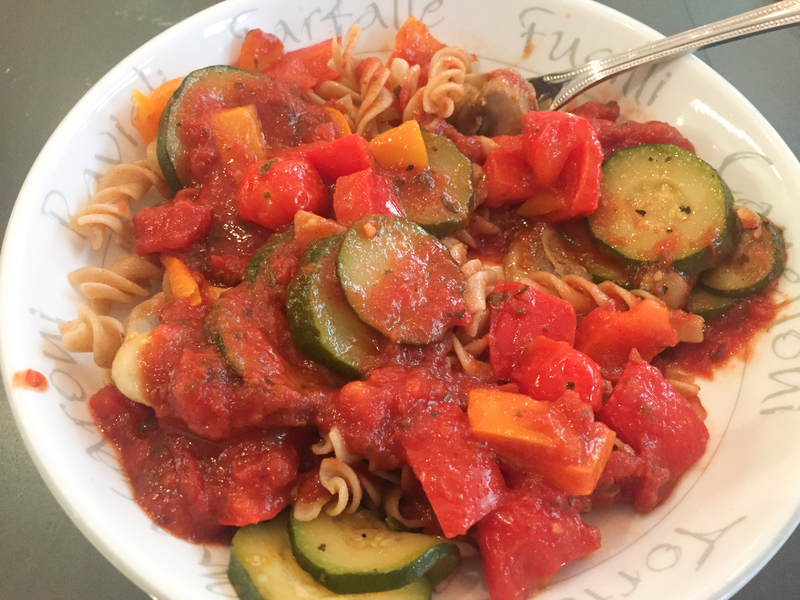 For dinner, I had planned to serve leftovers, which were whole-wheat pasta, sautéed vegetables and pasta sauce. 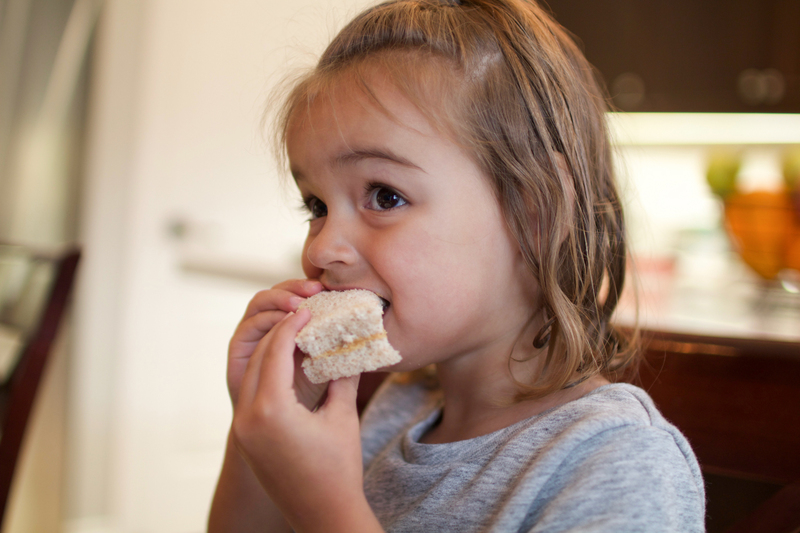 Everly had a peanut butter sandwich made with whole wheat bread and blueberries. Mia had leftover macaroni and cheese, with a squirt of vegetable puree mixed it. Despite the dinner-fail, we had a great family meal together. I knew that Mia and Everly had a variety of healthy foods throughout the day and they were tired. You see, with toddlers, I’ve learned to choose my battles. 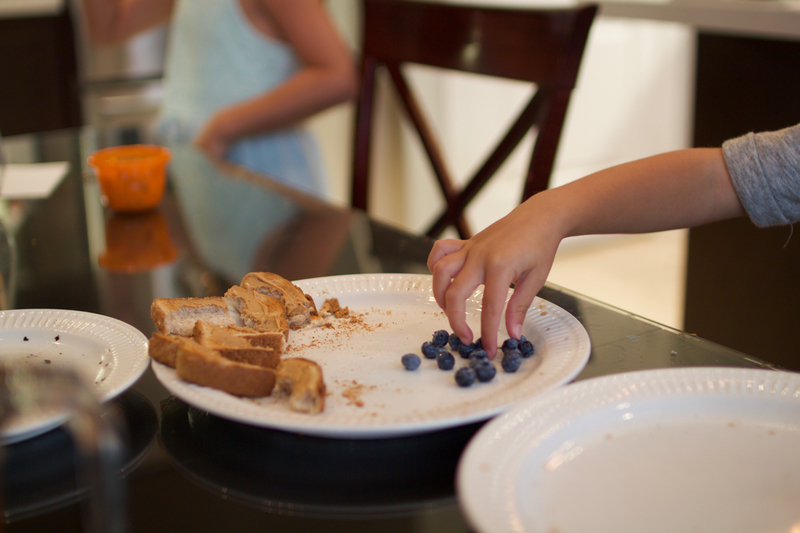 This was a very typical day for us, and knowing that Kids and Company takes a bit of the “mealtime battle” weight off of my shoulders makes all the difference. With locations all across Canada, Kids & Company is a high-quality care and early development centre that parents can trust and kids will love. It started under the leadership of two moms (one with 8 children! ), who felt there was a need for flexible care options in a setting with amazing teachers, community, proven development programs and an understanding of today’s families. You can find out more about the Kidco Kitchen here. Whether it’s their Grab ‘n’Go snacks, parent workshops, or their complimentary care for date nights and shopping days outside of regular hours, nothing has been forgotten. Here’s where it gets exciting… right now Kids and Company is waiving the registration fee (a $150 value) for Nesting Story readers! Just email msawatzky@kidsandcompany.com to access this exclusive offer. One waved registration per family for a newly registering child before December 31, 2017. Subject to availability.